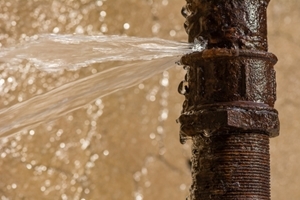 Are you tired of that leaky faucet or damaged pipeline? Then call Bluewater, Plumbing, Heating, and Air Conditioning today and get your plumbing fully restored. We offer complete plumbing repairs in Queens and the surrounding areas of New York for all types of systems in residential properties. No matter how damaged your plumbing is, you can depend on our team of certified and experienced technicans to accurately assess the problem and make the necessary repairs giving you long term results! Headache Free Business - We give you accurate estimates, clearly explain the work to be done, and never surprise you or leave you guessing about our service. Everything is in black and white. You are free ask any questions you like, and we will answer them in a straightforward manner. Accurate Assessments - We have the equipment and tools necessary to inspect your entire plumbing system. This allows us to precisely pinpoint the problems and tell you exactly what is going on. Long-Term Repairs - Have you ever had something repaired only to turn around and call the company back out to your home? At Bluewater, Plumbing, Heating, and Air Conditioning, our goal is to provide long-term permanent repairs to your system that last, so that you can on with other things. Professionalism - We conduct our business in a professional manner. This includes everything from our professional appearance to the way we treat our clients. We value your business and want you to be satisfied with every aspect of the job. Our technicians are friendly and courteous. 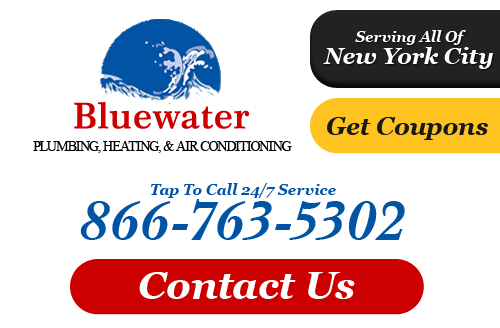 One of the benefits of partnering with Bluewater, Plumbing, Heating, and Air Conditioning for plumbing services in Queens or any of the surrounding areas of New York is that we offer a wide array of services that cover any problem you may have. We repair all types of systems no matter what material your pipes are made of. We repair faucets, fixtures, water heaters, drains, connections, water lines, pumps, garbage disposals and can repairs leaks in your tubs, showers, or sinks. We are skilled and certified in dealing with all types of plumbing problems. So whether you need pipe repairs, drain repairs or emergency plumbing repairs, you can count on our team of plumbers in Queens for dependable and prompt solutions. You may discover that your entire plumbing system is too old, too damaged, and beyond repair. If this is the case, then we can wipe the slate clean and totally revamp all the components of your plumbing. We start by getting a clear picture of your plumbing network and then begin re-building your system piece by piece to completion. You new plumbing will last you several years with no problems, and you'll enjoy all the benefits. From copper repiping to replacements for kitchen and bathroom remodeling projects, you can count on our Queens plumbers for top quality plumbing repairs in New York. If you need plumbing repairs in Queens or the surrounding areas, please call 866-763-5302 or complete our online request form.